Why Ta-Da List is Dan Sullivan's "employee of the month"
Dan Sullivan makes websites and considers Ta-Da List his "employee of the month." Many times I do web work that might not be noticeable to my clients at first glance. I might spend a day setting up Google Analytics, installing WordPress plug-ins, optimizing the graphics they gave me so they load faster on the web, fiddling with DNS, proofreading their past blog posts for typos or editing them to enhance their SEO. At the end of the day, my client might ask “What did you do on my site today? !” and all I have to tell them is blah blah HTML blah blah CSS plugin conflict blah blah blah. I can make a checklist in English and share it with my client via email. They can get in to see it, edit it, and watch progress via RSS or by returning to the list. They can add to the list without setting up a user account & password! Now if my client wonders what is going on today, or how much is left until launch, all they have to do is check the tadalist. It also has a sweet looking iPhone interface, so its worth adding to your homescreen. Be sure to email it to yourself before you share it as a backup, and good luck keeping a clear and open communication with your clients. They’ll thank you for it! Slate.com on Ta-Da List: "A dead simple [to-do list] manager...it looks great"
This is a dead simple manager created by 37signals, the influential Web application company. You create a list (say, "Move to Alabama") and then you begin adding specific tasks ("Hire movers," "Sell snow shovels," etc.). Once you create a task, you can reorder it in the list or check it off as done. That's pretty much it. 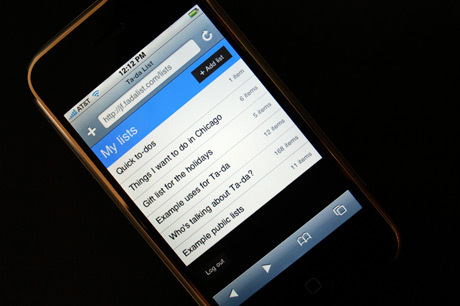 Ta-da List is free, and it looks great, especially on the iPhone. Some helpful advice for to-do list makers in Basecamp, Backpack, and Ta-Da List: In "Clearing Up a Blurry Work Life" [NY Times], Gina Trapani, the founding editor and lead blogger for Lifehacker, the popular site that offers “tech tricks, tips and downloads for getting things done,” offers her secrets for writing a successful to-do list. There are lots of ways you can make a to-do list into something that actually gets done. Often when people get to the point when they are writing it, they are doing a brain dump. They just have to just get things down on paper. But to get to the point where you’re checking things off, you want to make it a do-able to-do list. Things need to be as easy for yourself to do as possible. So you have to break things down into tasks. We sabotage ourselves by writing down things like “Plan the anniversary party” or “Learn French.” Those are projects, not tasks and don’t belong on your to-do list. Having problems with your Ta-da Lists Widget? Then go ahead and download v1.3, released today. According to the developers, the new version should solve the recent issues some have experienced. If you're not familiar with Ta-da Lists Widget, it's a free Dashboard widget for OS X that offers quick access to Ta-Da List. The widget has been downloaded over 30,000 times and lots of Ta-Da List customers love it. It's awfully nice to be called one of the makers of the web's prettiest and most functional tools...thanks Wired! iPhone owners should also check out the recently launched Campfire for iPhone. Fluid lets you run any webapp as a separate Mac desktop application if you've got Leopard. Fluid itself is a very small application. When launched, Fluid displays a small window where you specify the URL of a webapp you'd like to run in a Site Specific Browser. Provide an application name, click 'Create' and you'll be prompted to launch the new native Mac app you've just created. Use Fluid to run YouTube, GTalk, Flickr, Basecamp, Delicious, .Mac webmail, or any other webapp as a separate Mac desktop application. Here are high res logos for Basecamp, Backpack, Campfire and Highrise to use with Fluid. (If you're not on OS X, Prism does something similar for Windows and Linux powered by the Mozilla engine). "Useful Websites for Daily Tasks" is an article at AARP's site that recommends Ta-Da List, calling it the choice for "handy" to-do list management. I used to jot down my to-do tasks on little pieces of paper that got scattered about my desk, which wasn't too efficient for getting them done when they get lost or buried. So I decided to find a Web site that offered an easier way to manage my to-do list. The one I like best is Ta-da Lists™. This site is easy to read, the list is simple to use, and there's nothing to download. The best part is that the site sends you email to help you remember your to-do list which includes a link back to your list (useful for making edits to your list). It's great to see customers of all ages finding Ta-Da List easy to use. A few months back, we flipped the switch on Ta-da List for the iPhone. If you have an iPhone, just visit tadalist.com and you’ll see the iPhone version. You can access the standard web version with your desktop web browser. Both versions share data and lists. Just Another Mobile Monday, a mobile news site, just profiled different iPhone to do list applications. The author says, "For those who want no frills and a very basic feel, I’d go with Ta-Da List." In a Nutshell: Strong on ease of use. That description is accurate. Ta-da List is very easy to work with. All its screens fit well on the iPhone and feature a simple, minimal design feel. It uses large buttons to help you quickly add a new task, edit an existing one, and switch back to list views. Currently you are not able to add a priority, due date, or notes to a task. Also, if you want to re-order your lists you need to be on a desktop browser, where you can just drag and drop to re-arrange all items on a list. From the desktop, you can also mail yourself a copy of a list, and subscribe to be notified of changes to a list via RSS. Ta-Da List for iPhone: "Brilliant"
It's fantastic. The pages have been built to fit so well on the iPhone's screen that you forget you're on the web - it feels like a stand alone application on the iPhone. If you're a GTD freak (and even if you're not), you ought to check this out. I tip my hat to 37signals. Ta-Da List for iPhone is great. One of my favourite applications - ta-da list - which is basically an organizational to-do list application from 37signals is now available on the iPhone. This is brilliant because it makes your to-do list much more powerful when you can wander around with it! If you have an iPhone, just visit tadalist.com and you’ll see the iPhone version. You can access the standard web version with your desktop web browser. Both versions share data and lists.